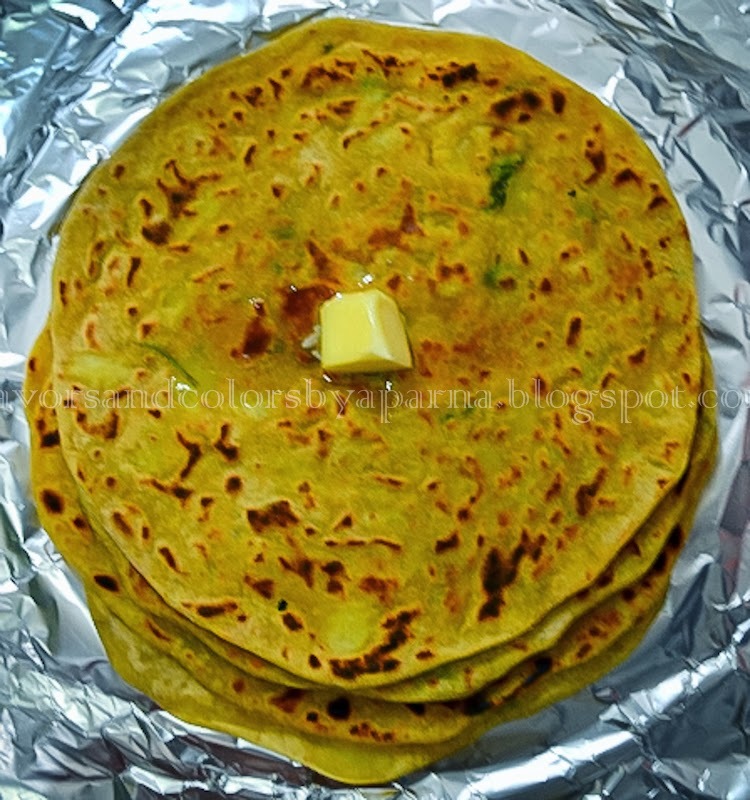 Parathas are shallow fried Indian flat breads and it can be stuffed with different fillings. The most favourite filling amongst all is the spicy potato mixture. Aloo parathas are quite popular in Northern parts of India and prepared for breakfast, lunch or dinner. 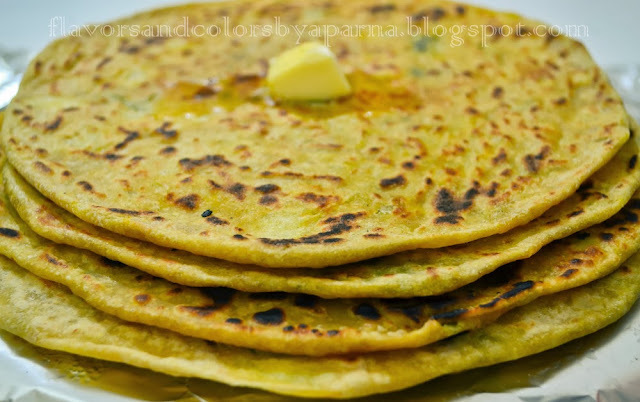 Punjabis are known to make best aloo parathas served with lots of makkhan. You will come across different spices/masalas being used to pep up the bland potatoes as filling/stuffing and the flat breads rolled out in various shapes. The end result is a tasty yummy dish which is a wholesome meal in itself and can be enjoyed with accompaniments such as pickle, curd, chutney, curry or just like that with blob of butter on top. My kids cannot resist parathas and when stuffed with potatoes, my elder one makes sure that he carries them in his tiffin box too. I am more than happy to roll these easy to pack parathas for him because I know empty box gonna make its way back home. Boil the potatoes, peel and mash them. [Alternately you can grate them]. Heat oil in a pan, add grated onions and saute them till they become soft. Add ginger garlic paste [optional step] and stir fry for few seconds. Now add mashed potatoes to them. Add finely chopped green chilies and all the spice powders. Mix it well and stir it on low flame for a minute or so. Switch off the flame. Allow the mixture to cool. Divide this mixture/ filling into equal size balls. Divide the dough into equal size balls. Take one ball at a time and roll out into thick circles. Place the filling in the center or the rolled dough. Bring the edges of the rolled dough together to enclose the filling. Keep this stuffed dough aside for few minutes. Do the same with remaining dough and filling. Now dust the rolling board with wheat flour and roll the stuffed dough gently into circular/ triangular or square shaped thick parathas. Fry the rolled parathas on both sides on hot griddle using oil/ghee or butter as per your preference. Serve hot with your choice of accompaniment. And the aloo parathas served hot with blob of butter on top ........ Yummm!! 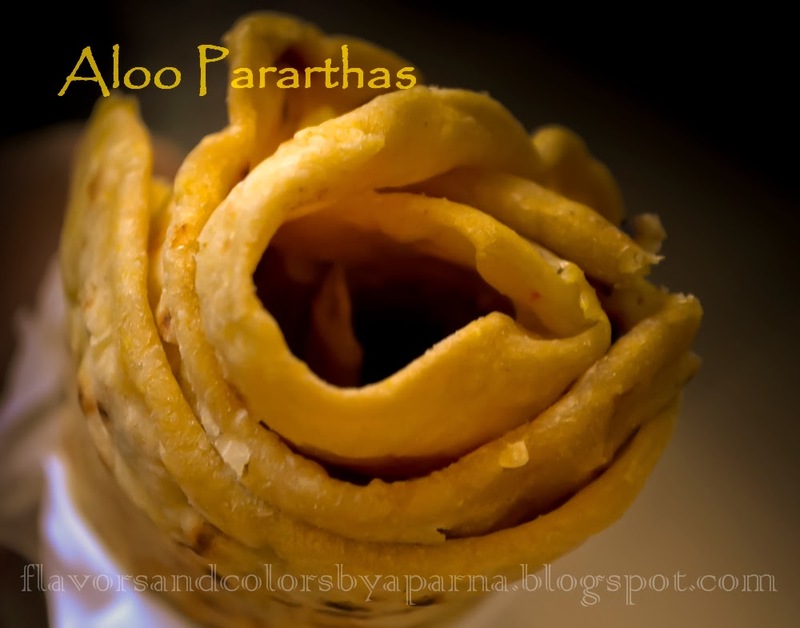 I always prepare a firm dough which helps me in rolling out the parathas with stuffing inside it. Sometimes, when I am short of time I just boil the potatoes, grate them and add different spices to it without cooking them. I try different ingredients and experiment with the potato stuffing such as adding chopped mint leaves, anardana seeds, cumin seeds, kalonji seeds, ajwain, lemon juice, kitchen king masala powder etc. With your imagination you can try different combinations as per family taste preferences and prepare the filling mixture.